Due to environmental demands, car manufacturers now have to use water-based paints. Whilst being environmentally safe, they are prone to fading and oxidization. Harmful environmental pollutants like road salt, detergent, tree sap, acid rain, traffic film and the sun’s powerful UV rays constantly threaten the lustre of your paintwork. This regular surface erosion means that your paintwork needs protection if you want to retain that ?like-new' showroom appearance. But, it's not just your paintwork that’s under threat. Dirt and grime carried by you, your family and your pets, plus accidental spillage of food and liquids means that your vehicle’s interior is at risk from staining too. 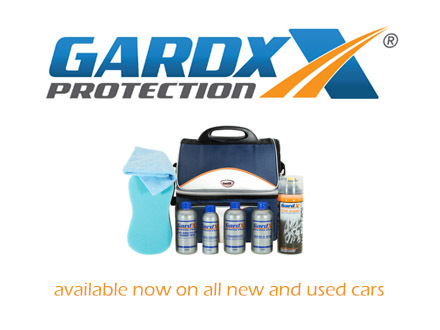 The GardX Vehicle Protection System (VPS) provides valuable protection for your vehicle, enhances its future re-sale value and comes with the assurance of a LIFETIME GUARANTEE. GardX VPS paintwork protection is a professionally applied two-stage application with powerful Nanotechnology. Stage 1 is a pre-seal formulation that penetrates into the molecules of the paintwork preparing it for sealing with Stage 2. Stage 2 permanently bonds to Stage 1, creating a high-gloss protective coating over the paintwork, like a second skin that resists attack and contamination and provides a super-smooth, high-gloss, ultra-protective finish that retains its appearance wash-after-wash. Once treated, you may never need to polish your car again. The high gloss finish is exceptionally easy to clean. To maintain your paintwork in peak condition we recommend washing your vehicle with GardX Wash & Wax, and on a monthly basis rinsing with GardX Conserver. Wash & Wax and Conserver are included in your take-home pack and can also be purchased from the GardX webshop (www.gardx.co.uk). The GardX System also protects your vehicle’s interior. GardX ?Stain Guard' ensures that your seat fabrics and carpets will resist against staining and remain fresh, smart and clean. For leather seats GardX 'Leather Guard' will not only protect against stains, but will also keep the leather soft and supple, like new for years. For your windscreen GardX Glass Guard creates a far safer driving environment by coating the windscreen with a formulation that repels rain and causes it to bead and aerodynamically run-off. Your area of vision dramatically improves by keeping glass free of rain, snow, frost, salt, dirt, bugs and grit. The GardX Vehicle Protection System also includes Tyre Guard. If one of your vehicle tyres puncture, GardX has the solution. Just connect Tyre Guard to the tyre's valve, depress the actuator and Tyre Guard will re-inflate the tyre and repair the puncture. A quick, safe and simple temporary repair which is a highly valuable safety feature. The GardX Vehicle Protection System has achieved British Standard EN ISO 2812-5:2007 and is manufactured under a quality management system accredited to ISO9001.